Any metal-head worth their weight in steel is well aware of this documentary that was released in 1988. It’s a truly fascinating look at life as rocker in the 1980s. For better or worse, warts and all, it absolutely captures a time and a vibe & scene that can never truly be replicated no matter how “retro” a band may act. 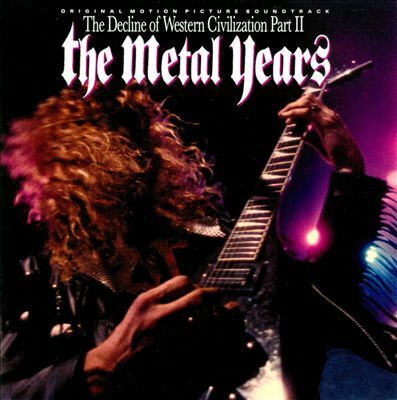 As it stands, the soundtrack to The Decline of the Western Civilization Part II: The Metal Years is a solid compilation. Sure, bands like Seduce and Rigor Mortis didn’t stand the test of time but when it comes to the ’80s metal scene, you can’t really argue against the inclusion of bands like Motorhead, Lizzy Borden, Megadeth, Alice Cooper, Guns N’ Roses, Metal Church or even Faster Pussycat. It was all metal one way or another. The documentary itself was actually what turned me on to Megadeth as they performed “In My Darkest Hour” in the film and it certainly made an impression on me. The lack of Ozzy Osbourne, Aerosmith, Poison, KISS or W.A.S.P. is a bit odd given how their stature and appearances in the documentary but the soundtrack isn’t meant to be all encompassing. If it was, we’d be putting up with having to listen to the likes of London, Tuff and Odin, too. A few tracks either start or end with audio clips from the film. We could argue for hours over who truly deserves to be included on a compilation of ’80s metal but this soundtrack is just a taste of what that era had to offer and is meant to tie in most closely with bands featured in the documentary. Keep that in mind and what you’ve got is a good collection of ’80s rock & metal that will fit right in with your retro denim vest. Not too long since it was released, I have been listened to this album on and off. My original plan was to review it much earlier but I wasn’t album to get into it. Reviews on this album have been mixed to say the least. Some people say it’s another great Armored Saint release and it logically follows their last few efforts. Then there’s the controversy as to whether this is a “metal” release or not. Firstly, despite not having heard 2000’s Revelation, I can definitely see the connection between this album and 1991’s Symbol of Salvation. Frankly, La Raza doesn’t even begin to compare to that 1991 classic. There’s just too much filler on La Raza. Symbol of Salvation is one of those rare, great albums where there’s no filler at all. Upon my first complete listen to this album, the only song that stuck out is “Chilled”. It’s a great song that reminds me of Symbol of Salvation yet has enough modern flavor that any younger band could probably get on the radio with it. The rest I would have been hard pressed to remember. Given that I’ve spun this album ten times or more by now, other favorites are popping up. This is one of those albums that I really had to keep listening to over and over again to get enjoyment out of. Now, there has been some controversy over whether this is heavy metal. Well, I say it is. Compared to the band’s catalog, La Raza brings no more or no less “heavy metal” than they usually do. I’ve always thought Armored Saint straddled the line between heavy metal and hard rock anyway. There are a few songs on here I would say are strictly heavy metal and then a few others that are pure hard rock. At least John Bush still delivers in the vocal department. My only issue with him is a recent interview I read where he basically sounded like he was dragged into this project. Though he doesn’t say this, it sounds like he really doesn’t have a lot of passion left for music. 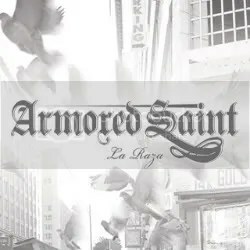 Armored Saint reuniting was Joey Vera’s doing and while he and John Bush co-wrote the whole album together, knowing that Bush originally didn’t want to do it and had to be talked into it ruins a bit of the enjoyment for myself. I think the whole Anthrax fiasco took a lot of fight out of him. My final thoughts on this album are that it is a good solid rock/metal release but it didn’t “wow” me. It was one of the more anticipated albums of 2010 for me so perhaps I set my expectations high. It failed to meet those expectations but after a few listens it has grown on me. What a great album cover! 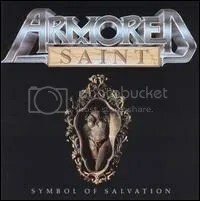 This was my first Armored Saint album and it was by accident because if I’m remembering correctly, I actually meant to pick up Symbol of Salvation. I had mixed up the titles, but my intent was the same– to pick up what was generally considered to be the “best” Armored Saint album. I was disappointed when I got online at home and realized I had bought an album that All Music Guide only gave 2.5 stars to. You can only trust your own ears, but for a time, in the early 2000s, I trusted AMG more than I should have and I think their review influenced my opinion a lot on this album because I remember not liking this one for the longest time and giving it very little play outside of the few week or two of buying it. It’s amazing how much you can enjoy something when you stop listening to others and go into things with an open mind (yes, this works for all walks of life) because this is some great American power metal! I still think Symbol of Salvation is their best release, but this album sits right at home next to it. Supposedly there were some issues in the songwriting department for this album because Chrysalis wasn’t happy with what they were hearing (they wanted that all important “hit”) and they basically forced the band to record “Saturday Night Special” in addition to pretty much re-writing everything. Well, whatever writing/recording problems the band was going through, I still think they delivered in the end and I even like their cover of “Saturday Night Special”. Unfortunately, even after six-months of recording going into this album, the album was not a commercial success and Chrysalis dropped the band, but that’s okay. 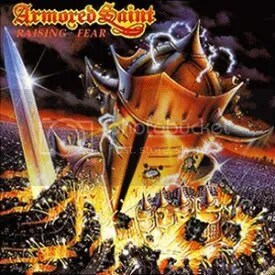 And to think, my first Armored Saint album was Raising Fear, an album that never really impressed me, and I nearly wrote off this band before finally deciding to give their most praised album a shot. Good thing I did take the chance on this album because it’s become one of my favorites in my whole collection. A great bit of melodic heavy metal from top to bottom, every song sticks with you and John Bush is killing himself over these songs. He puts so much emotion behind it all, he’s an amazing vocalist. “Reign of Fire” is great opener that pumps you full of metal and energy, but the true highlight for me it “Another Day”, which, if I’m not mistaken, all the lyrics were written by their late-guitarist Dave Prichard, who sadly passed away just before recording the album. Very emotional song for the band, obviously, and for anyone who listens to it knowing the story behind it. All across the board, definitely the band’s finest moment. Highlights: All of it, one of the best metal albums I’ve ever heard.